Laparoscopic pelvic lymphadenectomy was one of the original laparoscopic urologic procedures described in 1991 (16,17). Concomitant pelvic lymph node dissection can be performed during either transperitoneal or extraperitoneal laparoscopic radical prostatectomy (18). 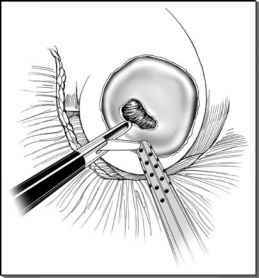 If the lymphadenectomy is being performed in conjunction with radical prostatectomy, the port placement should be that preferred for laparoscopic prostatectomy. Most commonly, a five-port "fan" or "horseshoe" distribution is used. After pneumoperitoneum is established, 10-mm trocars are placed at the umbilicus and at the lateral edge of the right rectus muscle. A 5-mm port is placed one fingerbreadth medial and cephalad to the anterior superior iliac spine. Two 5-mm ports are then placed in comparable positions on the left side. If a separate staging laparoscopic pelvic lymph node dissection is being performed, a diamond configuration is utilized with 10-mm trocars placed at the umbilicus and 5 cm above the pubic symphysis in the midline. Additional 5-mm ports are placed bilaterally in the midclavicular line near McBurney's point. Orientation is initially achieved by noting external iliac artery pulsations and the anatomic location of the internal ring. The peritoneum overlying the external iliac artery and/or on the external iliac vein is opened sharply. A combination of blunt and sharp dissection is used to skeletonize the posterior surface of the external iliac vein, dissecting the obturator node packet off the pelvic sidewall in the direction of the pubic bone. Once the obturator nerve is clearly identified along the posterior edge of the lymph node packet, the distal aspect of the nodal packet can be safely clipped and divided at the pubic bone. Throughout the dissection, the obturator nerve is kept in view. The nodal packet is gently dissected and reflected cephalad toward the bifurcation of the common iliac vein. The nodal packet is clipped parallel to the obturator nerve, detached and extracted with an endoscopic spoon biopsy forceps.